Despite having a first class ticket to ride, some great comic concepts often miss the train and end up in four colour limbo, all but forgotten. In Lest We Forget, I pluck one of those limbo-lingerers and pimp their need for a comeback. This time around it's Marvel's Savage Steel. 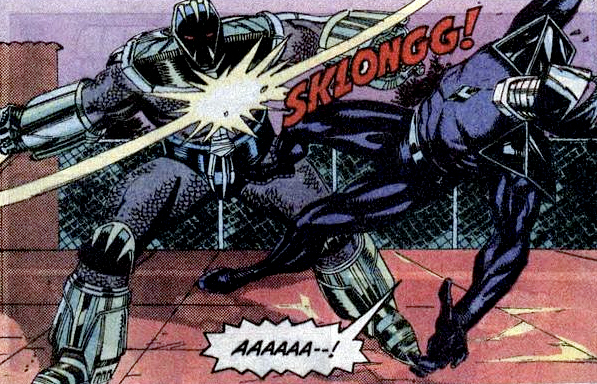 Savage Steel came from the fourth issue of 90's teen-title Darkhawk - back in the days where comic creators often proved their mettle by telling done-in-one stories, rather than starting with 'trade paperback' in mind. While armoured men are no strangers to comics, Savage Steel bent that law (and many others) in more ways then one. Even when Police step outside the law to enforce their own sense of justice, they are still just armed men. However the Cabal was different - they had a razor sharp edge in the form of the Savage Steel armour - and any crooks or drug dealers stepping into their neighbourhood to do business had better be prepared to get cut. However it wasn't all gunfights and battling vigilantes like The Punisher. Having used pay-offs from local mob boss Philippe Bazin to finance the suit, the Cabal was starting to divide. Unable to see eye-to-eye with his fellow renegade cops Jimmy Zafar and Harry Lennox, Mike Powell disappeared after accepting one last pay-off. Missing money and angered over the braking of the ranks, the event also created one of those great Marvel full-circle moments, as Mike's disappearing act lead to the emergence of the Darkhawk - Savage Steel's most persistant pain in his side and eventual ally. I said eventual ally. Although Zafar was considered as a recruit for the Initiative program during Marvel's Civil War, that doesn't mean he still woudn't be better served back dealing to the grim'n'gritty streets, maybe in the upcoming Punisher series? A proven vendetta against Frank, cop mob-justice, shadow societies, and armour that can pump 50 rounds in the blink of an eye - who's going to argue with that? 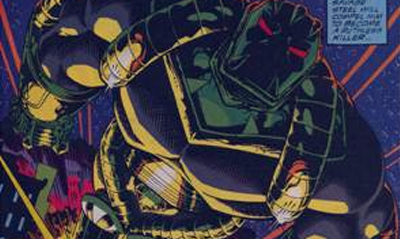 HOW I’D SHINE ON SAVAGE STEEL: Easy - bring back Darkhawk. Unlike Nova, the key to what made Darkhawk tick as a title was the way it brought the cosmic to a mob warfare setting. When the cosmos became the book's primary location it just didn't read the same. Use Savage Steel and the Cabal to root the reborn concept in place, give him a hit-squad of off-duty police officers in the field and even Wolverine will whimper before stepping into the ring against him. Nice article. I'd forgotten all about Savage Steel. I believe I had those issues back in the day, but they're long gone now. If written well, alot of these characters deserve to come back. I reckon Dale.I soaked up a lot of titles in the 90's that never survived (maybe I was a jinx) but from Sleepwalker to The Ray, Darkhawk to the Wildstorm crew, a lot of them have characters to dust off.